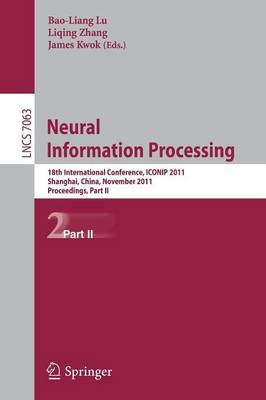 The three volume set LNCS 7062, LNCS 7063, and LNCS 7064 constitutes the proceedings of the 18th International Conference on Neural Information Processing, ICONIP 2011, held in Shanghai, China, in November 2011. The 262 regular session papers presented were carefully reviewed and selected from numerous submissions. The papers of part I are organized in topical sections on perception, emotion and development, bioinformatics, biologically inspired vision and recognition, bio-medical data analysis, brain signal processing, brain-computer interfaces, brain-like systems, brain-realistic models for learning, memory and embodied cognition, Clifford algebraic neural networks, combining multiple learners, computational advances in bioinformatics, and computational-intelligent human computer interaction. The second volume is structured in topical sections on cybersecurity and data mining workshop, data mining and knowledge doscovery, evolutionary design and optimisation, graphical models, human-originated data analysis and implementation, information retrieval, integrating multiple nature-inspired approaches, Kernel methods and support vector machines, and learning and memory. The third volume contains all the contributions connected with multi-agent systems, natural language processing and intelligent Web information processing, neural encoding and decoding, neural network models, neuromorphic hardware and implementations, object recognition, visual perception modelling, and advances in computational intelligence methods based pattern recognition.